Bible or Scripture Study is generally defined as learning what a particular book of the bible says and means. The Sacred Scriptures of the Bible are written in different styles and different literary genres and different languages than we read them in. It is necessary to know something about the author, the intended reader, the situation, the type of literature, and the language to fully understand the text. 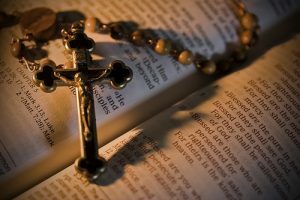 As Catholics, we generally believe in a contextual approach to reading and understanding Sacred Scripture and as Catholics we ultimately ask the church to convey the definitive meaning of the text. To better understand the Catholic approach to Sacred Scripture, please download (PDF) the document explaining the Catholic Approach to understanding God’s Word. Bible or Scripture Reflection is different. It asks us not what the passage means, but how the passage inspires in us. It is not Scripture or Bible Study, but reflection upon a passage of scripture. The Book of Isaiah is quoted in the New Testament more often than any other Old Testament writing other than the Psalms. Isaiah recognized that living in the presence of such a holy God demanded ethical behavior and reliance on God’s promises. The New American Bible introduction to the book describes it as an oracle “of singular poetic beauty and power… in which surprising shifts in syntax, audacious puns, and double-or triple-entendre are a constant feature.” The classes meet in the Ministry Center for thirteen afternoons (1:00-3:00 PM) or evening sessions (7:30-9:00 PM) on Tuesdays and although classes started on January 17th, its not too late to join. Sessions go through May 2nd with a 3-week break from February 14th to 28th. You can pickup an information sheet in the Church Office to find out more. To sign up, you can visit or call the Parish Office, or just show up on Tuesday afternoon or evening. There is a $15 materials fee for the books. Young adults through Senior Citizens are welcome. Questions? Please contact Steve Kuffner at 847-302-7433 or the Parish Office at 847-658-7625. Stop in to a meeting or call John Morici – 847-915-0223 or MaryAnn Watt – 847-854-3178 for more information. Ask to be put on our email list for upcoming events.